PULP Paper Art Party Installation! So the poems have been chosen and the slideshow is being put together for our installation at PULP Paper Art Party! We’ll have poems projected on a screen made of recycled paper for this amazing event at The Great Hall. You can also check out more HERE. Come check it out on FRIDAY! Tickets are in limited supply so make sure you reserve them ahead of time. Come on out to our all-poetry show! CALL FOR SUBMISSIONS! PULP PAPER ART PARTY and EW READINGS! 1. EW is announcing a very special CALL FOR SUBMISSIONS! We are looking for poets to submit work around the theme of paper, reuse, recycling, or the environment for a special collaboration with PULP: paper art party. Eligibility: Special consideration is given to past or upcoming EW readers, but this listing is open to everyone! Special consideration is also given to emerging writers who have not yet published a book. If you have published a book, still please submit! 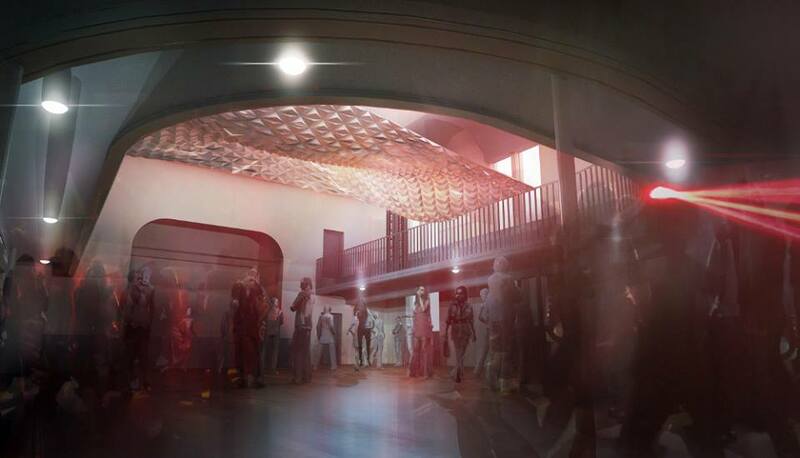 Date: The event is Friday, April 25th, at The Great Hall (1087 Queen St W). Poetry will be projected onto a screen as part of the installation throughout the night. 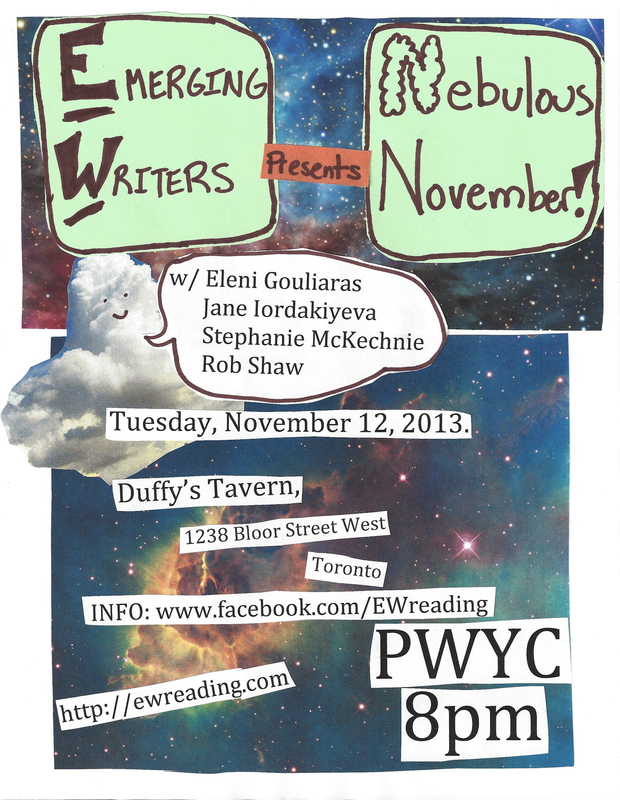 Poets are not required to attend if their work is featured, but it’d be fun if you can make it out! To submit: Go to the EW submittable. 2. EW is still looking for readers to fill up their 2014 year! We are looking for extra poetry readers for our April 2014 Poetry Month show! Eligibility: Professionally serious writers who have not yet published a book. Due Date: May 1, 2014. That is all!!! Hope to get your submissions in! Wear your fleece on February 11, 2014 for awesome prizes! Hope to see everyone out tonight at Nebulous November! Our submissions are open again. This time I’ll leave them open until May 2014. Make sure to get your submissions in to the submittable: http://www.ewreading.submittable.com. I’m booking up the 2014 season now. Our last show of 2013 is on November 12th! I hope to see everyone out! OPULENT OCTOBER! Coming soon to a bar near me! Well, Duffy’s Tavern is no longer really “The Bar Near Me” but it’s still relatively close. 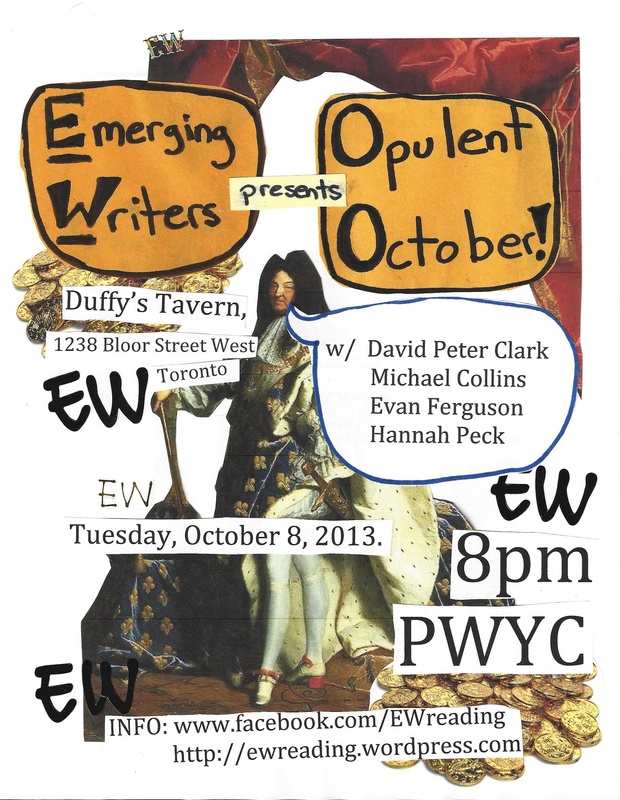 Westenders and Eastenders who like to travel, come on out on October 8th to see some great people read! It’s going to be a fun night for our second show of the Fall season. David Peter Clark, Evan Ferguson, Michael Collins, and Hannah Peck are all really interesting writers and well polished for still qualifying as “Emerging”. The show usually wraps up around 10/10:30, and of course, people are invited to stay out after the show as long as their weary heads and livers can handle it! And here are the sets! 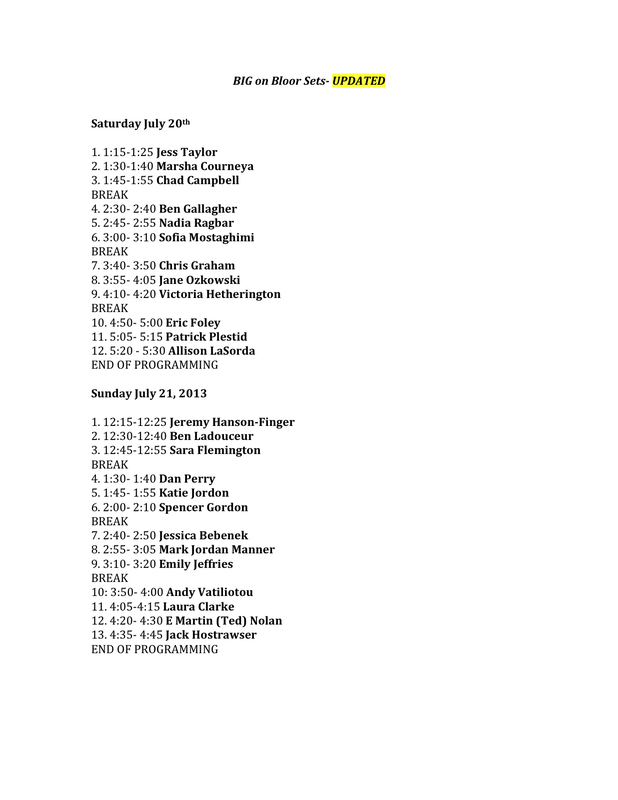 Hope to see you Saturday and Sunday at the Dufferin and Bloor Tennis Courts for our EW showcase!